This ticket offers you an organized tour to La Tomatina from Valencia. This amazing holiday package started on August 28th. The departure will be from ESTACIÓN DEL AVE DE JOAQUIN SOROLLA (AVE High-Speed Train Station) located on Calle San Vicente Martir 171 (Valencia) 46007 at 6:30 am, 7:00 am and 7:30 am. Meeting point: Mc Donald’s. 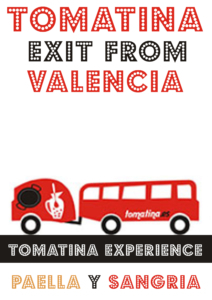 After the Tomatina, the return trip will be on the same date 28th August from Buñol (Valencia) at 14:30 pm, by coach. So, please, remember where the bus has parked in Buñol, it will be the meeting point to return back to Valencia.